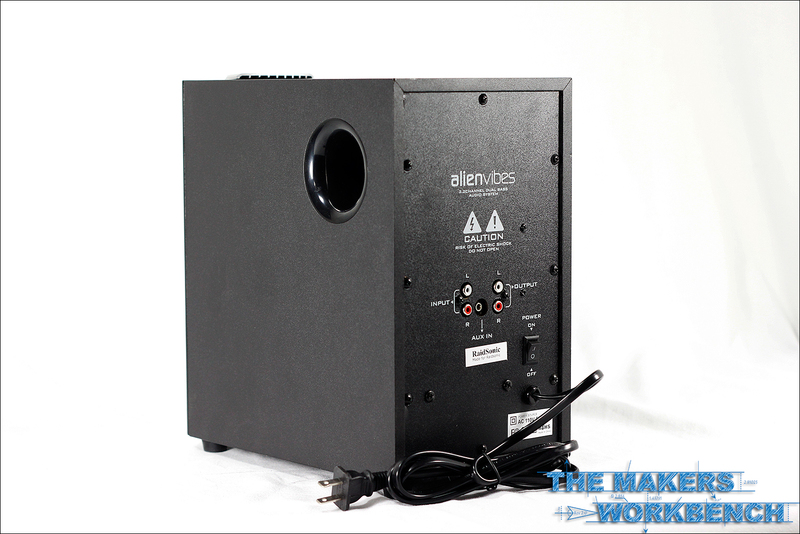 The AilenVibes line of PC speaker systems includes four different models that are each tailored to different budget levels. 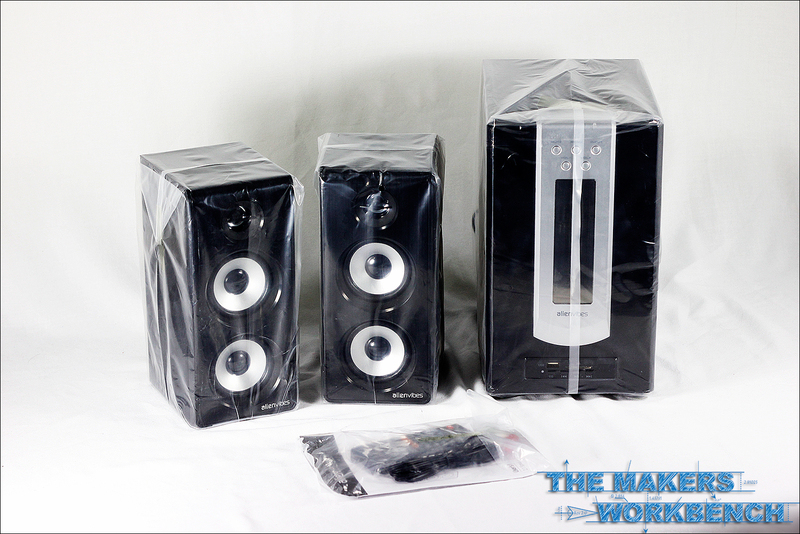 We have samples of all four systems on our review bench and will begin releasing those reviews over the next few weeks. 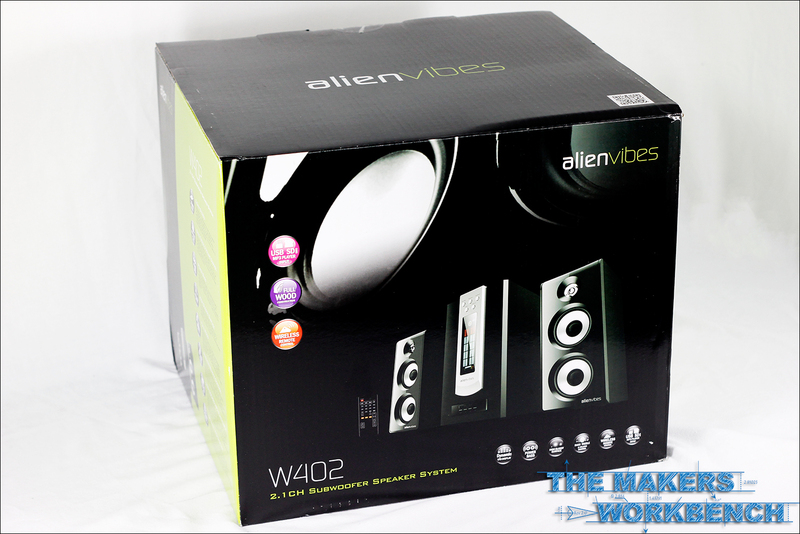 Today we want to launch this series of reviews off with AlienVibes' W402 2.1 channel system. They feature an all wood design that is augmented by plastic face-plates ensuring the highest level of sound quality possible. The W402 system features two 3" drivers and a single 1" tweeter on the left and right channels which provide crisp highs and resounding mid level tones. The main control unit houses the 5.25" subwoofer that deliverers a deep rumbling bass during music playback as well as game play. 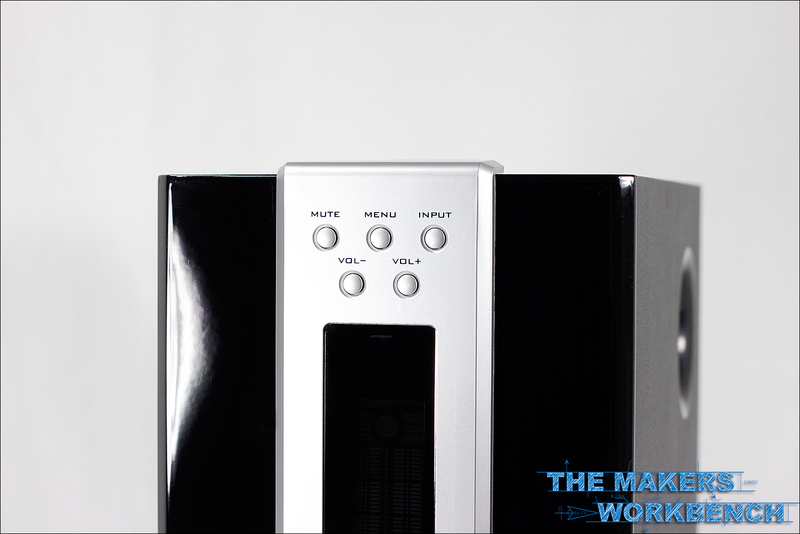 The system also features a front VFD display clues you in on what's going on while an SD Card and USB port are capable of MP3 playback. An additional auxiliary input is located on the back and can be broken out to a smartphone, MP3 player or any other input source that utilizes a 3.5mm audio jack. 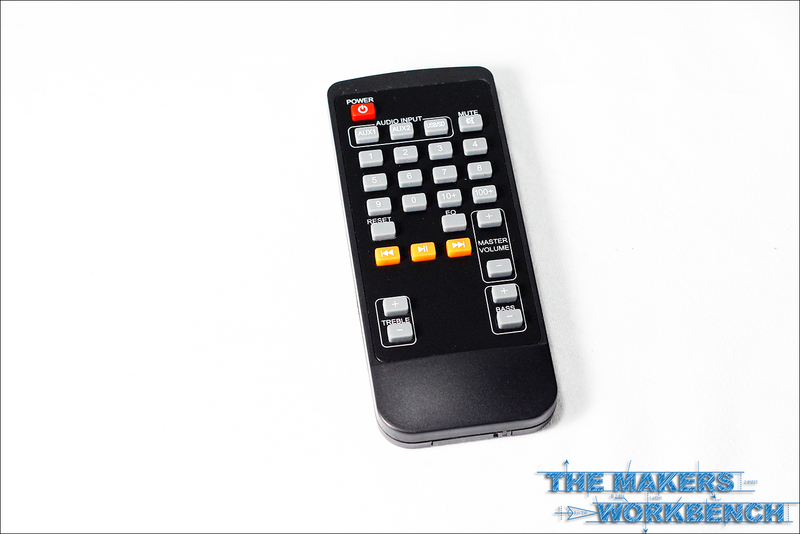 Maybe my most favorite feature of the W402 system is the included remote control. This feature comes in very handy when I want to adjust the volume from my workbench or fab table. When playing music via storage connected to the SD or USB ports, the remote is also capable of switching, pausing, and playing different tracks. Finally the remote has independent adjustment buttons for the treble and bass adjustments which is a very nice feature that you do not see on many higher end PC audio systems these days. The W402 is truly a thing of beauty as well as being packed with a ton of cool features that should please the audiophile in all of us. 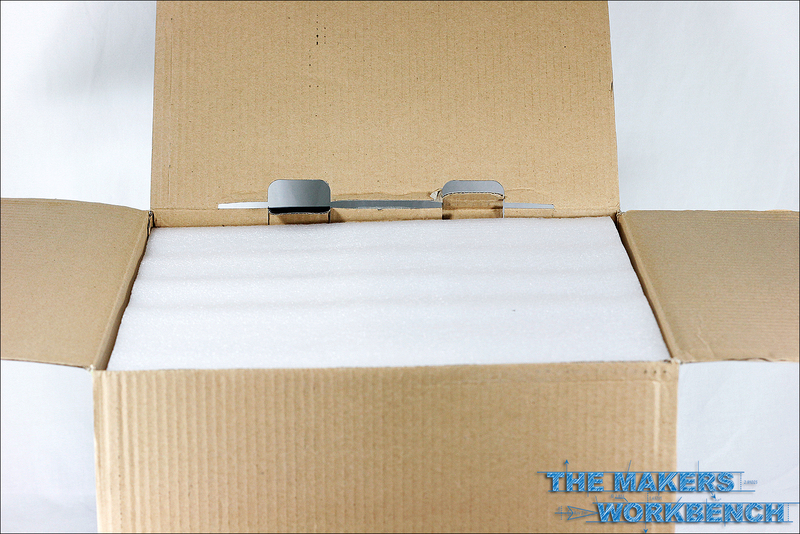 It arrived in a very sturdy box and was completely surrounded by protective closed cell foam. All of the piano black finished surfaces were protected by a plastic bag to prevent any chafing from any debris that may have gotten into the foam during manufacturing or packaging. You can definitely tell that close attention was paid to the packaging design process. I purchased a similarly priced Logitech system last fall that came with chipped corners, scratches, and one of the drivers even had damage to its surround because the packaging was cheap and sub-par. I am sure UPS played a part in the damage, but in today's world companies have to start packaging better to avoid such mishaps. Major points go to AlienVibes for paying such great attention to how they package and protect their products. Now that everything is unboxed and everything has been photographed, it is time to get down and dirty and really take a closer look at things. To start lets cover what you get with the W402 system. Along side the base unit which houses the subwoofer and amplification hardware, you get two very nice looking satellite speakers, a remote control, user manual, and an RCA to 3.5MM jack cable. 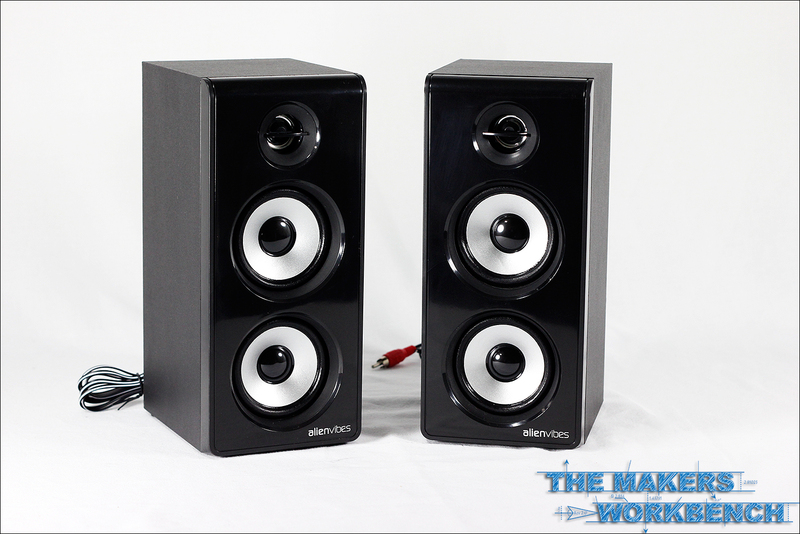 The satellite speakers that come with the W402 system are truly a thing of beauty. AlienVibes did a fantastic job on keeping the look simple and sweet. The choice to expose the silver faces of the drivers, and not hid them behind fabric or some gaudy grill really highlights the piano black finish of the faceplate. The rear of the satellites is are painted black (see image in gallery below) which is something so many other manufacturers seemingly forget to do. This is the little extra steps that Ineo is known for and one of the reasons they are high on my list of favorite companies. The main unit not only houses the subwoofer, but it also is the base for the front panel Vacuum Florescent Display, and USB / SD card input ports. Finished with the same polished mirror black paint job and accented by a silver bezel that surrounds the display, this has to be one of the best looking subwoofer enclosures ever seen on a PC sound system. Normally these enclosures are placed under or behind desk, but it would be a shame to hide such a good looking unit. Above you can see a tighter shot of the front control panel that features the external storage input ports. These ports allow you to play back MP3 tracks from an external storage devices such as flash drives, SD cards and even powered external hard drives. Also featured on this panel are buttons which allow you to select between tracks on those external storage devices. This is a very cool feature and I have used it several time when taking the system out onto the deck to provide music for BBQ's. The top of the LCD bezel houses the units manual control buttons. These allow you to fully control the unit in the event you lose the remote, its batteries die, or if you just prefer manual control. The buttons provide a nice tactile response which lets tells me that the button AlienVibes chose was a quality part. Turning the subwoofer enclosure around gives us a nice view of the side port which has been tuned to deliver a bass response as low as 35MHz. 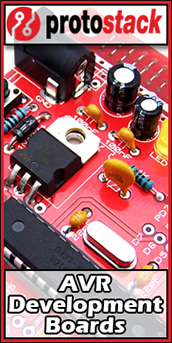 We can see the left and right channel input and outputs as well as a 3.5mm auxiliary input which comes in handy if you want to use the system to play audio from an MP3 Player, Phone or other audio device. A system power switch is also located on the back of the enclosure. Lastly we are going to take a quick at the W402's remote control. As I stated at the beginning of this review, this has to be my absolute favorite feature of this whole setup. The level of control this remote provides is amazing, and it lets me tune the sound output from within the sound system itself and lets me stop relying on software sound staging. It provided independent button control for bass and treble as well as volume control. Users who take advantage of the USB and SD card inputs will also be able to select between tracks using the remote. Play and Pause functionality is also capable when using USB and SD card input with the remote. I have decided to skip a "Testing" section for this review as I am not an audio expert, I do not own any expensive sound quality testing equipment and for the simple fact that I feel that the environment you place a sound system into has just as much impact on sound quality as the hardware does. I can tell you that the bass is low, deep, and impactful. When at full tilt, the bass reverberates in your chest, and the satellite speakers show no distortion that my ears can distinguish from actual music. 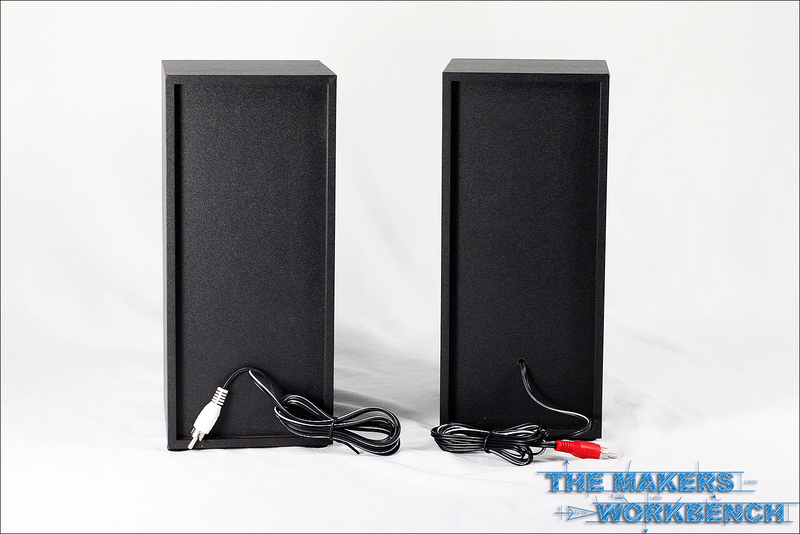 The 40 watts being sent to the subwoofer seems to be the sweet spot and unlike other systems, no one can say that the W402 is underpowered. When listening to classics such as Beethoven's Fur Elise or Symphony No. 5, the low to high levels are very well balanced, nothing seems to be overdriven, or under-driven. 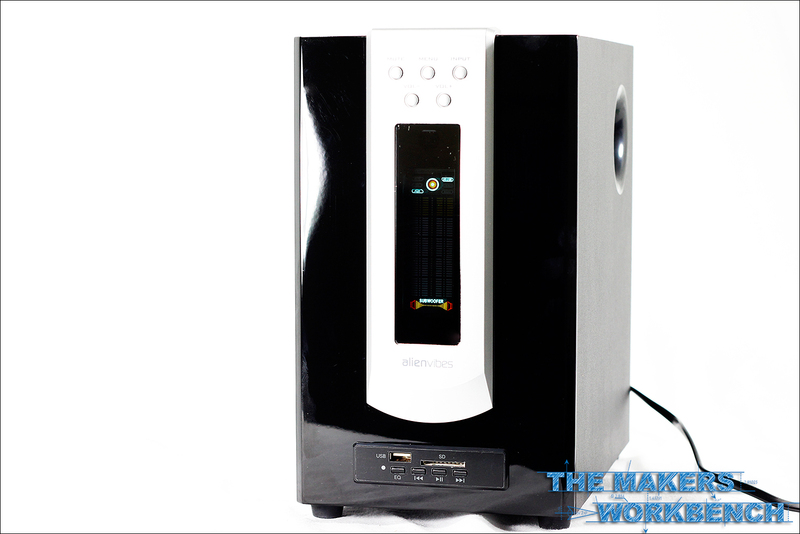 If one is more in-tune to modern rock or hip-hop the W402 system performs just as well. The bass is well balanced, and the highs are crisp and strong. During extreme bass sections, the 5-inch subwoofer really shines and delivers a thunderous, forceful sound. 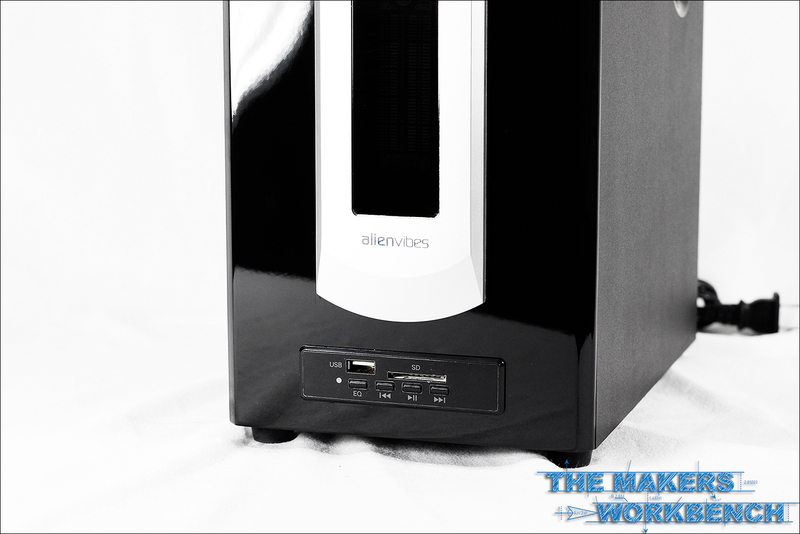 Gaming with the AlienVibes W402 system is a pure joy. Explosions in Battlefield 3 make you feel like the battle is happening right before your eyes. Gunshots are crisp and clear, the rumble of jets flying overhead will shake your whole room, and a tank rolling near by is an experience all into itself. On the opposite end of the gaming spectrum, the ambient sounds of Skyrim really show off the systems capabilities. Birds off in the distance really sound like they are a distance away from you, while dragons flying high overhead almost make you look up to see if your home has been invaded. I only have one small problem with the W402 system and it is most likely an issue created by me. The connecting cables for the satellite speakers as well as the PC to System cable is just too short for my set up. In AlienVibes defense I do have a 83-inch long desk, that sits a little higher than most. The cables turned out to be about a foot short each and I solved the issue by buying some extensions from Amazon which I have listed below. 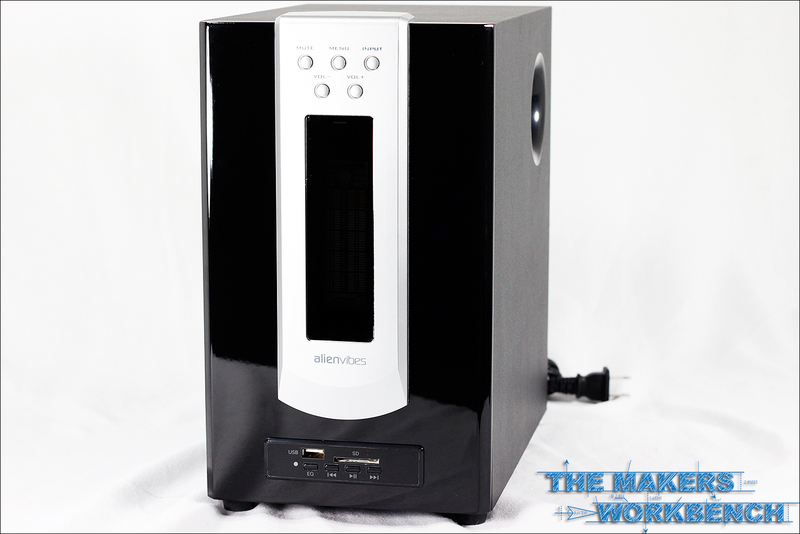 As I stated at the beginning of this review the AlienVibes W402 kit is one of the nicer PC sound systems at it's pricing point. 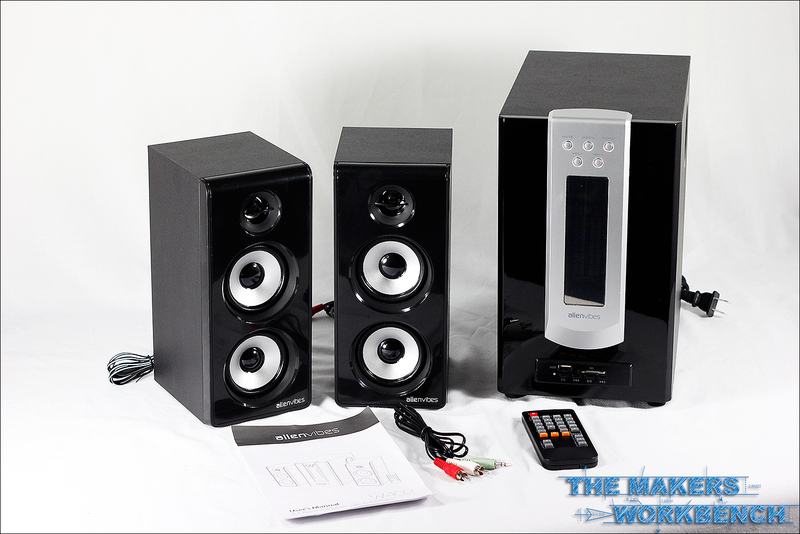 At $99 you will be hard pressed to find a better, more feature rich sound system on the market. 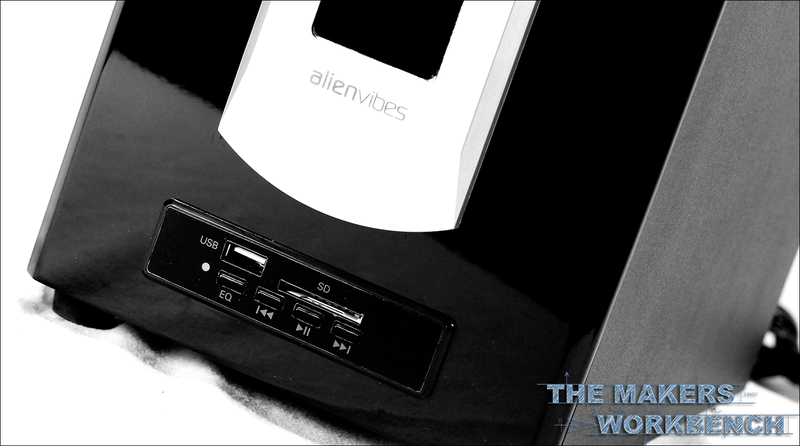 Having owned several Logitech and Creative systems in the past costing two to three times what the W402 does, I can honestly say that neither of them could come close to the performance I have seen from this offering from AlienVibes. I highly recommend that anyone looking for a PC Sound system for both gaming and music playback take a moment and seriously consider the AlienVibes W402 2.1 channel kit. 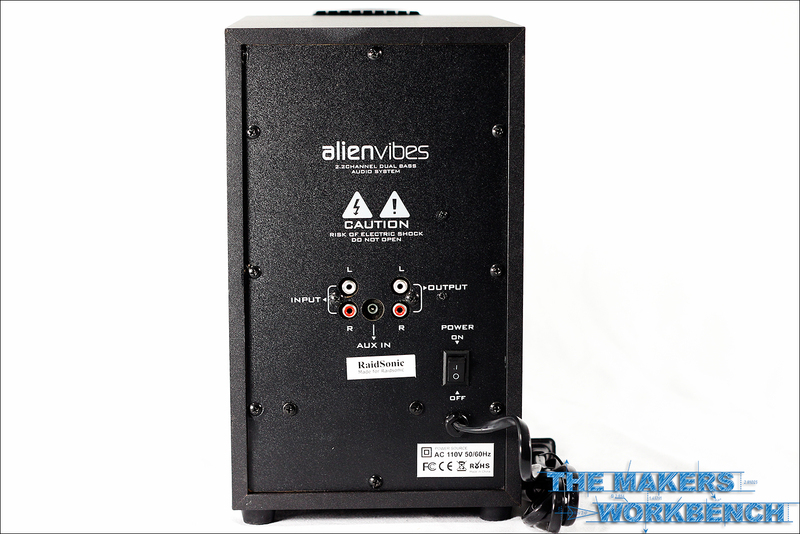 While this little issue was a nuisance at best, I can not find a single major issue with the AlienVibes W402 system, and as such I am awarding it our highest score of 100 points.